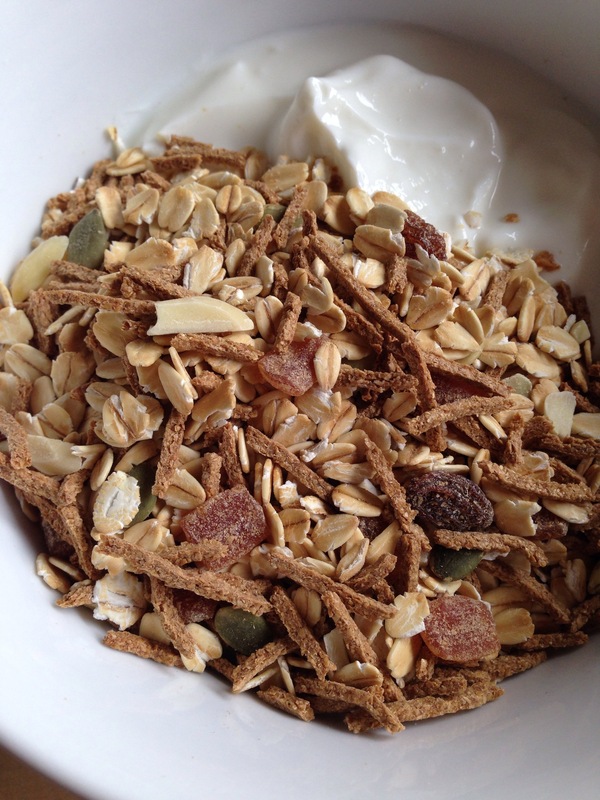 An All Bran new muesli on the shelf. I don’t know if you’ve seen but the muesli section of the supermarket is growing. I would love to buy a bunch of them and compare them, but, I’ll be eating muesli for breakfast, lunch and dinner if I did. 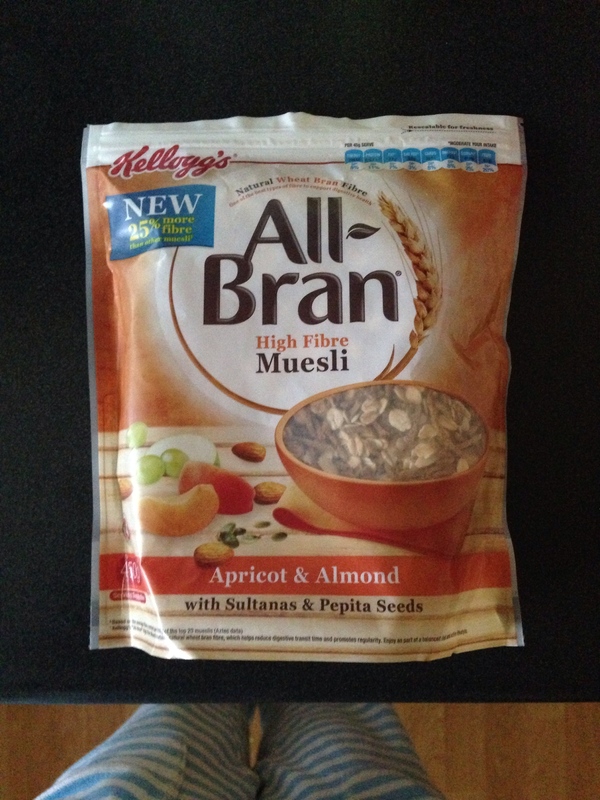 Kellogg’s All Bran High Fibre Muesli caught my eye a while back. I’m a bit picky with mueslis. I often find they are hefty on the oats and a little bit stingy on all the bells and whistles. And in this case, the bran content was worrying me. Look, I do want the bran, apricots, almonds and pepitas in my muesli, I just don’t want the manufacturer doing it for me. But I’ve caved, I ran out of muesli & this one was on special. In my product reviews I’ll break it down into the pros and the cons. The numbers. I like numbers. Quantitative data makes me happy. Also, the ingredients, because knowing what’s in the product helps us understand the nutrition profile. And lastly, I’ll give my quick verdict. Kellogg’s All Bran High Fibre Muesli Apricot & Almond with sultanas and pepita seeds, featuring my Peter Alexander onesie. – The combination of rolled oats and rolled barley make this product over half whole grain. – All Bran makes up a quarter of the product, together with the fibre from the whole grains, dried fruits, nuts and seeds, this makes it a good choice for fibre. – At 6.1g fibre per serve, this contributes to to 20% and 25% of the recommended daily intakes for men and women, respectively. – With fibre, comes the need to chew (Maybe this is a con for some?). This slows you down and helps with increasing satiety. – Almonds, pepitas, oats and barley provide some of your essential ‘good’ fats (monounsaturated and polyunsaturated). – I personally like all the different textures in it. – It comes in a resealable bag: no need to worry about ripping the plastic bag and trying to tie it to ensure freshness, or putting it in a container. – As expected, not enough of the bells & whistles. It’s only 5% almonds and 2.5% pepitas. – As this product contains barley and oats, it is not suitable for those people with ceoliac disease or gluten sensitivity. – I was rather disappointed to see that the apricot pieces ingredient list is longer that the entire product components. I also find it very odd that apricot pieces contain apple puree? Per 45g serve (1/2 cup): 720kJ/172 kcal/ 5.4g protein/ 4.7g total fat/ 0.7g total fat/ Carbohydrate 23.8g / Sugars 7.2g/ 6.1g dietary fibre / 47mg sodium. I liked it. I like All Bran (and only All Bran, don’t let the homebrand bran fool you) so it was a welcome addition for me. Personally, when I have it next, I’ll reduce the serve size and add more nuts & seeds to it. Have you tried this one or any of the other flavours? Note: this post was not sponsored. I just tried it. < For the love of Brunch: in Brunswick.